How We Discovered This Book: Since Christmas is nearly upon us, I felt compelled to look through our favorite Christmas books. Some of the books are sweet, some are spiritual, and some have a powerful message. This book is sweet and has an important message slipped in. A rich man has an accident in the Appalachian hills, and after he is nursed back to health by the residents, he feels compelled to repay the debt. Every December 23rd, he rides a train into the town and tosses a silver package to each of the children. A boy named Frankie wishes for different toys each year, but he doesn’t get what he wishes for. He gets a nice toy along with something more important – something he needs. The story comes full circle when Frankie is grown and decides to return to the town to repay his own debt. The book has a straightforward plot, with expressive and rich illustrations. Ms. Rylant manages to get across the key details without being too overt – how poor these children and families are, how to be grateful for what we are given, and how to share our blessings with others. My kids found the train and the silver packages to be magical, and couldn’t wait to find out what Frankie got the next year. The Polar Express is another one of our favorites – my, the fun things that trains can bring. Brainstorm with your kids or students on what they would wish for if a train came through their town. Find a service project to do with your kids or students. It’s not too late- there are needy people across the world at all times of the year. I find it’s most impactful if it serves a group they can identify with – other kids, people in their own town, etc. The Night Before Christmas by Clement C. Moore: There are tons of versions of this classic story, but we have a version illustrated by Bruce Whatley that is full of texture and unexpected depth. Snowmen at Night by Caralyn Buehner, illustrated by Mark Buehner: What do your snowmen do at night while you are sleeping? Jingle Bells by Kathleen N. Daly, illustrated by J.P. Miller: This is a favorite of mine from my childhood, originally published as a Little Golden Book in 1964 (for the record, I have the 7th printing from 1976). It has Richard Scarry-esque illustrations, and there is no way to read the book without singing. The Legend of the Candy Cane by Lori Walburg, illustrated by James Bernardin: Check out the review we posted in early 2013. What are your favorite Christmas books? Please share in the comments! 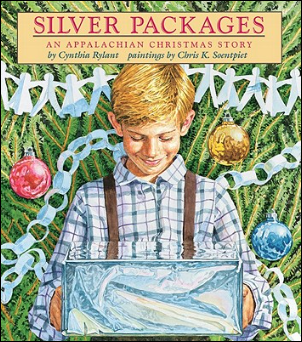 This entry was posted in Book Reviews, Katie, Picture Books and tagged author, Chris Soentpiet, Christmas books, Cynthia Rylant, illustrator, Silver Packages. Bookmark the permalink. I used to read many of Cynthia Rylant’s books to my daughter in the 80s and 90s. I missed this treasure. This story sounds special. Rylant continues to write beautiful children’s books for kids.